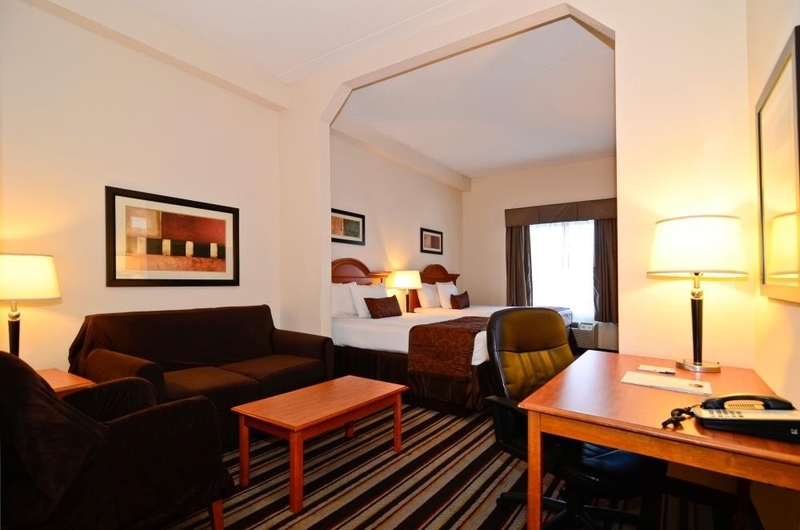 El Best Western Windsor Inn & Suites se encuentra en el centro de Danville. Venga y disfrute de las mejores atracciónes turísticas cerca de nuestro hotel. Precios bajos garantizados y ofertas exclusivas. Este hotel todo suites de Danville, Virginia, ofrece a los huéspedes un entorno cómodo, habitaciones espaciosas y una piscina cubierta con una relajante piscina de hidromasaje. 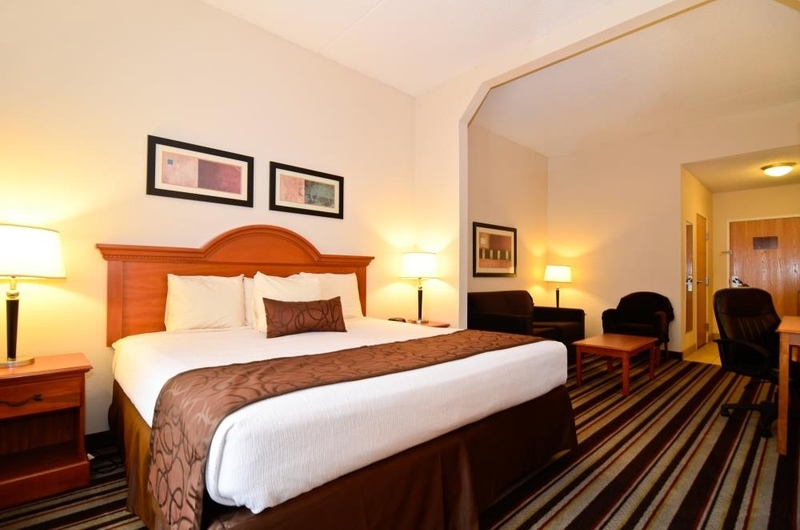 El Best Western® Windsor Inn & Suites es un hotel diseñado de acuerdo con las necesidades de los viajeros de negocios y las familias. Nuestras magníficas suites cuentan con un completo equipamiento que incluye acceso gratuito a Internet de alta velocidad, cafetera para una taza, nevera y microondas, un amplio escritorio y una cómoda zona para sentarse. Los huéspedes encontrarán que el hotel está cerca de las atracciones locales, las universidades y los centros corporativos en los alrededor de Danville, Virginia. Los huéspedes estarán situados a poca distancia en auto de la Universidad Averett, el Centro de la Ciencia de Danville, el Instituto de Investigación y Aprendizaje Avanzado, los Braves® de Danville, los deportes del motor de Birch Creek, el circuito de carreras internacional de Virginia (VIR), la Academia Militar Hargrave, Chatham Hall y el circuito de velocidad South Boston. El Best Western® Inn & Suites es el único hotel de Danville que cuenta con una piscina cubierta y con una relajante piscina de hidromasaje abiertas durante todo el año. Los huéspedes podrán disfrutar también de un saludable desayuno gratuito y de un centro deportivo de última generación. Espacio para reuniones con capacidad para 30 personas para eventos de grupos, reuniones con un reducido número de asistentes o sesiones de formación. 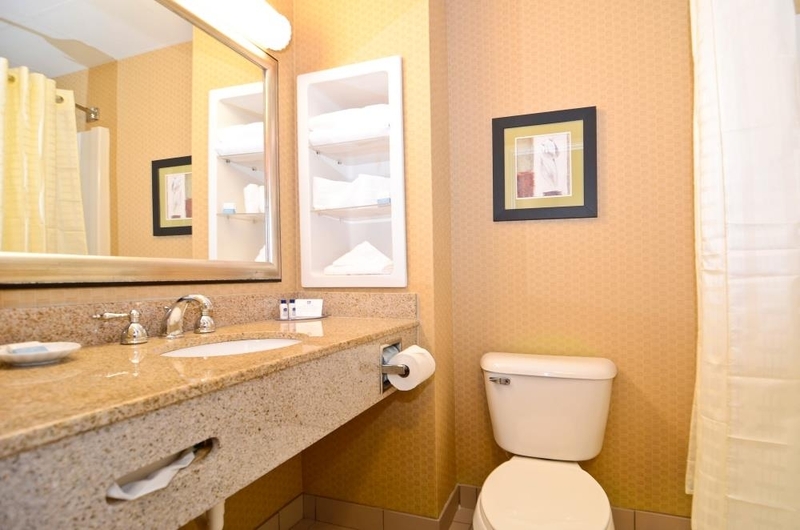 Realice su reserva en línea en el Best Western® Windsor Inn & Suites en Danville, Virginia. Disfrute de su estancia en nuestro hotel. Nuestra piscina se encuentra de reformas hasta el mes de mayo de 2019 con el objeto de mejorar la experiencia de los viajeros. This is an older property that could use a remodel. It was comfortable in my room with the sofa, arm chair and bed all in good condition. They just need to need new HVAC and décor to be redone. Breakfast was good but again the area needs to be redone. Great place to stay for the night, the front desk worker was very friendly and professional, he help out a lot and also gave us a goodie bag which my daughter loved! For the night and the price it was well work it!! Also the breakfast was great! Food was better than most of the Hiltons I stayed at! Great place to stay when visiting Danville.If you want to swim, call first as the pool was out of order during my stay.The staff was very friendly and helpful. Amanda was terrific. Great breakfast, even carried Soy milk which my grand-daughter needed. Beds were very comfortable. I had a double suite which gave me plenty of room. "Updated room decor a winner"
Been staying here for years and was impressed with some recent room updates such as improved mini fridge and comfortable seating options. Front desk staff always pleasant. Will continue to use in future. "Great Staff - Comfortable Hotel"
Staff is what makes this hotel great! Everyone was very helpful and friendly. 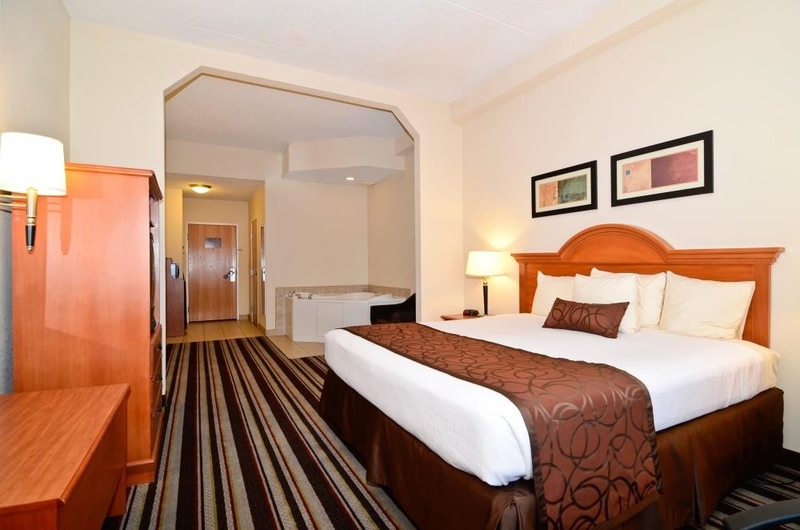 The hotel offers everything one would need and the newly remodeled rooms are very comfortable. I can see this hotel becoming even better over the next year. Thanks for a great visit! Wanted an indoor pool and workout room. This was one of several that showed both. They had neither. They had removed the workout room & the indoor pool was empty. Would have stayed elsewhere had I known. Room had the option to reuse towels or get new ones. Reuse hang them up, new place on floor. We chose reuse and housekeeping took them anyway along with my own personal hair towel. Then to top it off, left us no new ones and we were told by the front desk they had no new ones. The guy managed to scrounge up one, but no hair towel. Never got my hair towel back nor any compensation. And the general manager hides behind doors. We and our friends stayed here while traveling from Central Pennsylvania to Myrtle Beach. After a rather grueling day of travel through a lot of rain and fog we were tired and ready to settle in for the evening in what we hoped would be a nice motel. We were not disappointed! Our room was quite large with a separate seating area. It was very clean and fresh. The people at the check-in desk were very friendly and helpful. Breakfast the next morning was quite satisfactory and the ladies there were very helpful. All in all we were very pleased with our nights' stay in this modern clean, emphasis on clean motel. This was a good value for the stay in the area. The hotel suited my needs for a short stay. The staff was friendly and provided good service. The location is on a main highway and is easily accessible to downtown, as well as other parts of the city. There are only fast food options close by, but there are plenty of restaurant options a few miles away. Checked in to find two lamps on bathroom counter as the overhead bathroom light out. No shock hazard there. Fan housing draped open on ceiling. Next night bathroom fixed but have no bath towels. Went to lobby and told they are out of towels and gave me two hand towels as substitute. No excuse. Next night returned to find no shampoo. Again went to lobby and was informed that they are out of shampoo and gave me three conditioner bottles and two bars of soap and said this should do it. Most disappointed that throughout this not one apology was made by any staff. Will not return. Dear Valued guest, I would like to Thank you for taking the time to write a review on your stay. I would like to apologize on behalf of my entire team for the inconvenience during your stay at our hotel. Please let me know when you will be in town I would personally like to host your stay. We are currently under our renovation process and as the new GM of the hotel we are making some better changes for our guests to offer a better more comfortable stay. Once again I am very sorry for you and your family had to experience. This was THE worst experience! We made our reservation a year out. The General Manager took and entered our reservation. Since we had stayed there previously we thought everything was set. We arrived only to discover that they had overbooked by about 20 rooms and elected to send us to a Super8. We were beyond angry!!! No compensation, no phone call, no manger on site. Will never book there again! 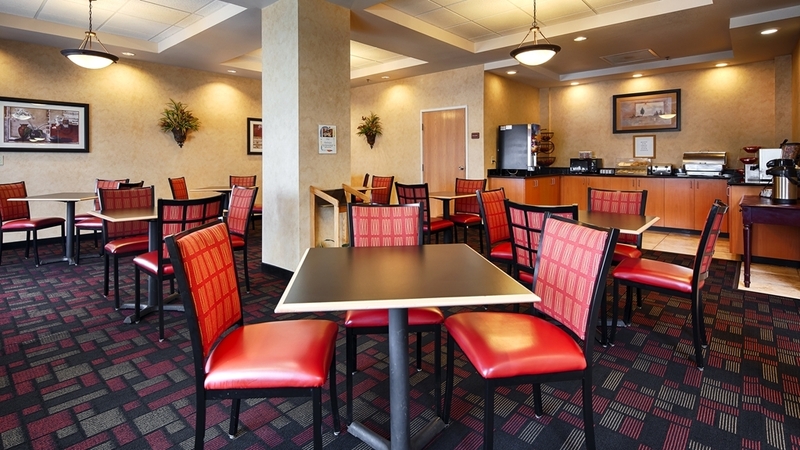 Almost perfectly clean; quiet; common areas are being updated; decent breakfast; very friendly staff. What more could you want? Given the price we paid (we spent more on dinner last night!) I'd say this is an extremely good value! And, yes, we will return. This Best Western has little curb appeal and the rooms are the same. While the clerk and rooms were not bad; there did not stand out either. The only outstanding item was the high price I paid for an unmemorable room. Outstanding customer service from all Staff from arrival to departure...I have stayed at this location twice in the last 37 days. My family and I are always greeted as if we were just there yesterday. Before I start this review I want to say I rarely write reviews but felt other guest should know the skinny. Pros: Location, Breakfast not terrible (for continental). Cons: Staff, Room cleanliness, Noise, Quality for cost, Very Misleading. 1) Room was not ready and the staff just didn't care. I typically wouldn't say anything about this because things happen, but I called before going to the hotel and was told to head that way. 2) Spider webs on the ceiling. Gross! 3) Room door was broken and wouldn't open all the way. (Split at frame on bottom). 4) Pool or spa was under construction and it didn't state that on the website. Even when I was checking in and told our room wouldn't be ready for an hour I told my wife while standing at the check in desk that I was going to check out the pool, the front desk person didn't even tell me then that the pool was closed. 5) Floor wasn't vacuumed (dirty tissues along the edge of the bed) not sure what they were used for but I can only imagine. 6) Very outdated poor quality rooms and beds. TV's may have been some of the first flat screens made and the remote didn't work. 7) Burn holes and stains on bed skirt. Also mattress covers looked as if they have never been cleaned. 8) After check in we had forgotten toothpaste so went to the lobby to ask if they had any available. The lady at the front desk talked to someone standing there about personal things while I waited for nearly 5 minutes. I might try this property if they can turn some things around. Maybe better trained staff, cleaning crew, updated bedding, carpets cleaned, pool fixed, gym fixed, TV's updated. "Friendly service and very clean"
Hotel lobby was getting a new HW floor and should be great when done! All staff was friendly and said hello every time I came or left. Breakfast selection had minor changes daily, which was nice. Everything was hot and fresh. Room was clean and everything worked well. Minor connection snafus with the internet that were a bit annoying. Stayed in BW in Danville,VA on June 28, 2018. Room was very nice, breakfast next morning also very good. Chef was very personable, and made sure I had fruit for breakfast.Room rates very reasonable for this area.Nice place to stay if you are in this area. "Worse stay in a hotel in 20 years"
Poor Management, allow for renovations to start on a holiday weekend in May. Elevator not working, assigned to 2md and 3rd floor. Was very upset/ House keeping put a DND sign on my door so they did not have tp clean the room. When I spoke to the manager about the issues, she did not care. I for corporate office number, was told its owner operated. Had to come back after 6pm in order to get to our rooms, One occupant was disabled and room was on 2nd floor. They told us this after we paid for our rooms. Did not turn the lights on in the pool, we had to request it. Poor management and the owner of the property cares less about happy customers. Was told he would be on site Sunday May 27th before we checked out, he was a no show. PLEASE READ REVIEWS BEFORE YOU BOOK THIS HOTEL. EVERYONE WAS SO UNHAPPY WITH HOTEL. WOKERS SHOWED UP A WEEK EARLY, SO MANAGEMENT APPROVED FOR RENOVATIONS TO START ON A HOLIDAY WEEKEND, BAD IDEA. My family always stay here when we visit Semora, NC. And as always it was exceptional. The room was clean, the staff friendly. When we needed some thing extra the staff was very quick to meet that need. As I said we love it here and will be back in June. The pool was closed for repair but had been for sometime according to the staff. The exercise room had a black trash bag over the window and wallpaper covering the sign. We had stains all over the carpet, mold in the bathroom, rips in the shower curtain and an I'll fitting covering for the sofa to hide God only knows what! Do NOT stay here. We were in town for the STP 500 and decided to stay east of the race track since we were headed to VA Beach after the race. The toilet clogged, there was little to no water pressure in the shower, and the shower didn't always drain well. Each day, we had to ask for towels because they shorted us each day. The pool was broke and wasn't going to be fixed until June, but no one offered a discount. The hot breakfast was actually decent and the menus changed each morning (which was nice). The breakfast staff and housecleaning crew were very nice, but the hotel itself was a dump. Clean but... Terrible bed, wifi (dial-up slow). Pool out of order. Not enough outlets. Front desk thinks answering phone is more important than checking you in EVEN when I can see people in the office not answering the phone. Didn't even get the reservation right - ended up w/ duplicates. Headlights in parking lot point directly into room window. My wife and I were here recently and were quite surprised that this hotel exceeded our needs and expectations. We will definitely return to this hotel again in the future because of our affiliation that is located in this city. This place should be closed down for code violations. We stayed here over the holidays… Despite the smell of mold, and the filthiness of the lobby and rooms… We also had a leak in our room which destroyed some of our property. The hotel management did nothing about this. I wouldn't Kennel my dog in this place. If you have to drive 20 miles out of your way to stay at the local Motel 6....do it! Because it would be better than this gutter of a fleabag motel! I've stayed with best western for several years usually because of the indoor pool but I've also stayed because we're able to go downstairs and have breakfast it saves us a ton of money when we take our kids! Beds were stiff. Hotel staff was wonderful. Back door entrance to hotel was broke, supposed to be able to use key to get in but you didn't have to. I feel that needs to be fixed. Bathroom door didn't lock in room I was in. Probably wouldn't stay there again. Upon check in 12/7/17 I inquired about the location of indoor pool/hot tub and the clerk pointed to sign dated 11/18/17 that stated the pool/hot tub was shut down for maintenance. I expressed my disappointment as this was the reason we choose this hotel. On their web site it advertised a pool and hot tub. The hotel was a little more than others in the area however the only one advertising a heated pool & hot tub. The clerk did not even offer an apology. Thank you giving us the feedback, we apologize that pool is closed temporarily, we hope to welcome you back soon. Needs to communicate remolding to Guest before or a least apologize at Check in. Items broken in room response from staff is Lazy. Cursing and Arguing from staff in public area. Breakfast, Service and Food, above expectation. Thank you for feedback,we apologize for any inconvenience and hope to welcome you back . "my kids treated me to a weekend away for my birthday." I was very pleased with my stay..the room was neat and clean..The dining room attendances they were great.the whole crew was freindly..I plan to go back soon.. Maybe for valentines day with the hubby. "Wonderful Stay at Best Western of Danville, Va."
I currently live in Germany and come to Danville at least two times per year to visit my mother who is living in a nursing home. Therefore, I have to stay in a hotel from 2-3 weeks each time and I always choose this hotel because I enjoy the friendly staff, it's clean and I feel safe there. The rooms are large and comfortable-quite a bargain! Wifi is fast and reliable and there's always a hot breakfast. 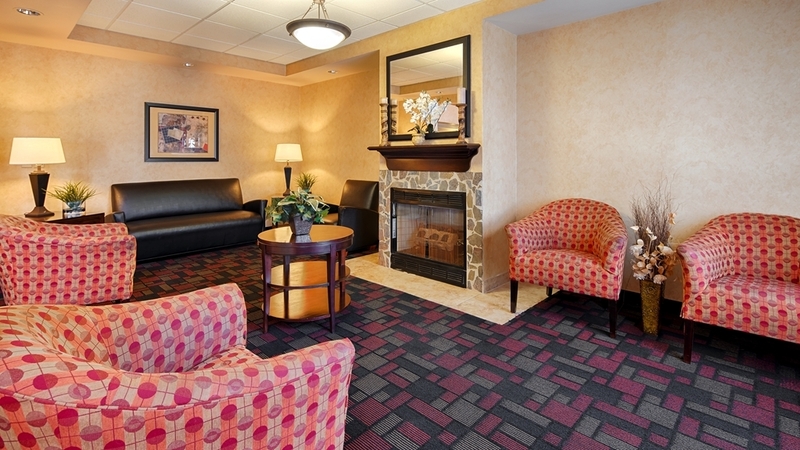 "Very comfortable and wonderful staff"
Spent three nights there over Thanksgiving weekend. If one wants to pick, yes, it's not perfect. The pool is out of order. The bathroom sink didn't drain fast. The heating in the room-varied from a tad too hot to a tad too cool. But, hey, the A/C and heat worked fine ! Fast hot water. Fridge, microwave, and coffee maker in the room. Free breakfast. Very comfortable bed and pillows. Plenty of seating, a couch and chair with a coffee table. The staff were very accommodating and friendly. We had just flown in from a very early flight, and were able to check in early as a room was available. During our stay, we saw several behind the desk clerks, all were helpful and friendly, as was the room attendant. OMG the folks who maintain the breakfast area, they were the best. The area was very clean. They asked if you needed anything. I observed one employee offer to make the waffles for a couple who were not familiar with the waffle iron. The manager has done a wonderful job in hiring a staff who see their jobs as something more than just a job. Hopefully we'll return to Danville for another trip, and we'll certainly stay here. Easy checkin and check out, clean facility, good selections for breakfast, helpful staff, good location, close to restaurants, airport, and stores. Would recommend staying for a short stay or a long stay. Defiantly will use again. Thank you for your feedback, we look forward to welcoming you back. Overall good experience! Broken lobby fountain detracted from the decor. Great staff and awesome breakfast. Danville very historic city and great sites. Very convenient to airport and eating areas. Thanks! Thank you for your feedback, we look forward to welcoming you again. The staff are fabulous. Rooms clean. Good service. I did not have any issues while staying there. A good nights sleep. The coffee was to die for and the breakfast was a nice continental. I will visit again if in the area. We booked a king suite with a jacuzzi tub 3 months before our trip and confirmed it one month before. Upon check-in our room was DOWNGRADED to a king room with no jacuzzi tub. I argued and they shrugged and said oh well. The room has a sink that doesn't drain and a dripping tap and they aren't going to fix it. Terrible hotel with terrible customer service. Rude staff. Will never stay at a best western again. "We had a 2 room Suite for $90"
Thank you for your honest feedback, we look forward to welcoming you back. Hotel needs updated HVAC, cleanliness attention and staff education on being helpful as opposed to being insincere. Bed was best benefit. Overall would not stay again, better options for the $. Stayed for location. "Great Place for races at VIR"
Conveniently located to VIR. The staff is A-one, very helpful and professional. My room was spotless and very comfortable. The lobby and breakfast area were clean and the coffee was always available and hot. Breakfast was good and the wi-fi was super fast. Will book this hotel for my next visit to VIR. Staff was very friendly and helpful. The room was very clean and organized. The beds were very comfortable. Breakfast buffet was excellent with a great variety of foods. A great location to the Martinsville Race Track. We would recommend the hotel to anyone in the Danville area. We will be returning in a few weeks. Thank you for your feedback,We are glad that you were happy with your stay,we hope to welcome you back soon. 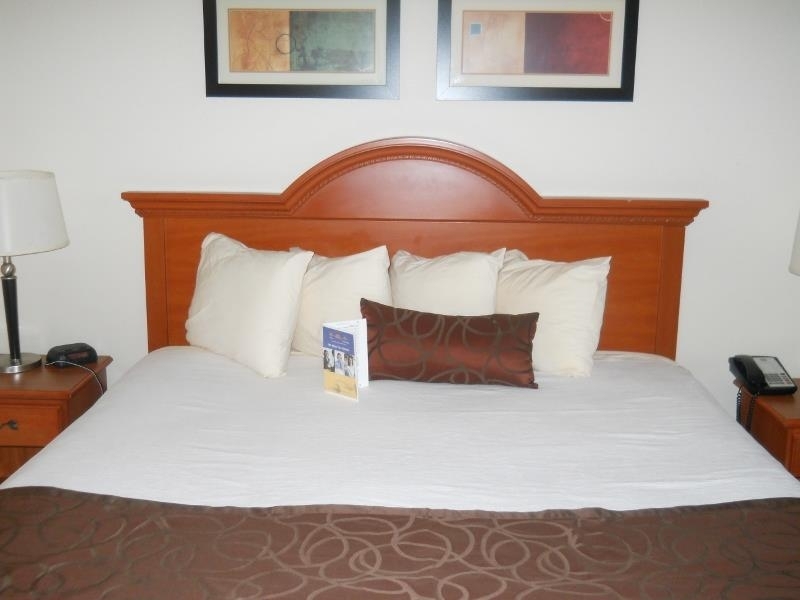 "Large Room, Comfortable Bed, Friendly Staff"
Upon arrival, we were greeted by a friendly young man at the front desk. The following afternoon, a very polite, friendly young lady was at the front desk. I noticed each time we left and returned we were always greeted with a smile. We were pleasantly surprised by the size of our room. We had a room with a king bed and sitting area. The windows are large, can be opened and let in lots of light. The bathroom is an adequate size. I loved having the three built-in shelves next to the sink allowing us to keep the counter space free of clutter. Our room was very clean and the furniture was in good shape. The mattress was comfortable. We did not hear any noise from within the hotel and minimal noise from the road. Breakfast was above average for a Best Western. I especially liked that they offered Greek yogurt! The two people taking care of the breakfast area were friendly and helpful. They offer to make the waffles for you! The breakfast area was very clean. Breakfast items were being restocked often. The hotel is located near a Piggly Wiggly and several restaurants. It sits back off the road and is not jammed up with other hotels side by side. The area appears very safe. We stayed two nights while going to the VIR. We would definitely stay here again. "Nice Hotel, but needs repair"
This is a nice hotel but I am afraid it is falling to disrepair. While I was there the indoor hot tub and pool were not working. The room was nice but smelled musty. The personnel were helpful and very personable but many of the amenities along with the grounds need some attention. Maybe I arrived at a time that coincided with some maintenance issues but I will be reluctant to stay again. We love this hotel. Everyone is so friendly & accomodating. Shawn is especially nice! He goes out of his way for his guests. The staff is wonderful. We already booked our next stay at Best Western in October. The room was extremely clean, and the hotel felt very safe during my stay. Hats off to the amazing staff! I have not seen better staff at any hotel stay, EVER!! You truly have some of the best in the business at your facility! Also, the bed was so comfortable!!! normally I have trouble sleeping in hotels, but this was super lovely! Thank you everyone for your service and for making my stay absolutely fabulous. I highly recommend this hotel to anyone staying in this area. "Best Western Hotel, Danville, VA"
I have not used a hotel accommodation in some time as I have not traveled in several years. This hotel meet my needs and was very well set up. All the staff were very friendly and helpful. The breakfast area was clean and had many food options. My only disappointment was that I could not access the guest computer in the main lobby for some reason. I did not attempt to get help from the front desk as I was ready to leave in any case. I recommend this hotel for a visit to Danville, VA. Due to this being a single experience with this hotel chain I rate it as Very Good as I have no long term experience with the Hotel Chain. We booked this hotel at the last minute. The hotel staff were helpful and there was more than one person available when we checked in after 9pm which is unusual. Room was clean and comfortable. We were greeted by a friendly attendant in the breakfast area who offered assistance with the waffle maker and directed us to whatever we needed. We recently stayed here while attending freshman orientation for Averett University. Room was decent but had a weird smell. Hotel could use a good cleaning and upgrading. Pool filthy and had a smell to it. Beds were super comfortable and although the bathroom was clean, the faucet in the tub was very loose and the shower head sprayed water everywhere. Not enough towels and washcloths in the room. The best thing about the stay was the breakfast crew. Mr. Shawn and Ms. Tammy!! They greeted every guest as they came in and went out of their way to make sure everything and everyone was good to go. Ms. Tammy even made my son's waffle and he was so happy! They kept the place spotless and made breakfast a wonderful experience. "Great hotel for one day "
The room was looked like the cleaning staff takes pride in there job. The room has a bed, tv and a small fridge. The staff was friendly. The breferkest was great to. The hotel also has a pool and free WiFi. The building and furnishings are getting pretty old and in need of major refurb. But the staff is MUCH improved over what I experienced a few years ago. They all seem to be attentive to their jobs and make the place as good as it can be. The man who manages the breakfast area is particularly good. He takes his job very seriously, and the facility is fortunate to have him. We drove up to visit the tank museum and got a good deal on the hotel room. We had a king size bed with a jacuzzi tub in the room, it had a regular tub/shower in the bathroom. We didn't use the pool or fitness room but did take advantage of the Continental breakfast. 1st day the usual breads, fruit, coffee and juice was offered by they also had eggs already maybe into omelets with potatoes and ham. They had waffles that a breakfast attendant, Shawn, made for me both mornings. You can have the worn chocolate chips, strawberries and whipped cream. 2nd day they had scrambled eggs, turkey sausage and potatoes. The best free breakfast I have found so far. The staff are super friendly and helpful and our stay was a pleasure! The 'suite', a sitting area with small sofa and coffee table was very convenient. It meant the early riser had a quiet place to read / email, etc. My only suggestion - having a sink and mirror outside the shower / toilet room would have been helpful since there were 2 of us sharing the room. Convenient place for me to stay while attending events in Providence, NC and Danville, VA. Hotel a little dated but satisfactory. 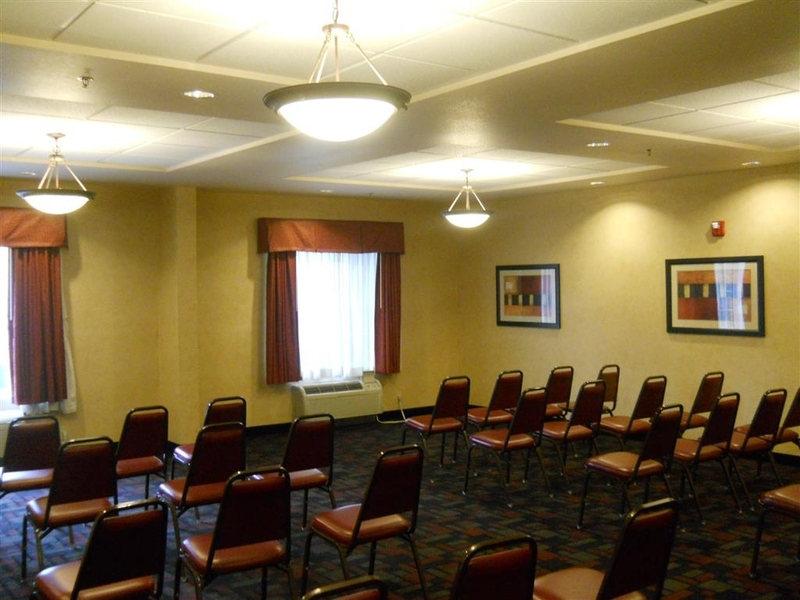 Rooms are large and pleasantly arranged. Plenty of parking! Breakfast staff wonderful! Stayed 3 nights in a good room that some moron had smoked in, but the odor was taken care of promptly by staff, so I remained there in that room. Breakfast is very good and that operation is run by a very sweet and personable lady who tries hard to please. The only elevator broke on a Friday night, so that probably created some heartburn - I was on ground floor but my friend was on the 3rd floor with a lot of luggage. It wasn't repaired as of Sunday at Noon. Location was great for our purposes, plenty of free parking, beautiful indoor pool, and good fitness room, free wifi, etc. Ice machines all worked properly and vending machines were stocked. Just needs a new elevator or new repair service. Great hotel for the mid range price. Friendly staff, and all the amenities you need for your stay. Breakfast is served fresh and hot and offers a wide variety of selections. Indoor pool and fitness center round out the services offered. Passing thru Danville, VA on June 6, 2017, and needed a room for the night. Called the hotel and a room was available. Room was very nice and clean. The room rate was very reasonable also. Next morning had a very good breakfast before checking out. Plenty of parking space available. Getting in and out onto US 58 no problem at all. I was pleasantly surprised by this hotel! I wasn't expecting much since we were just booking it for the convenience of location, but it was great! 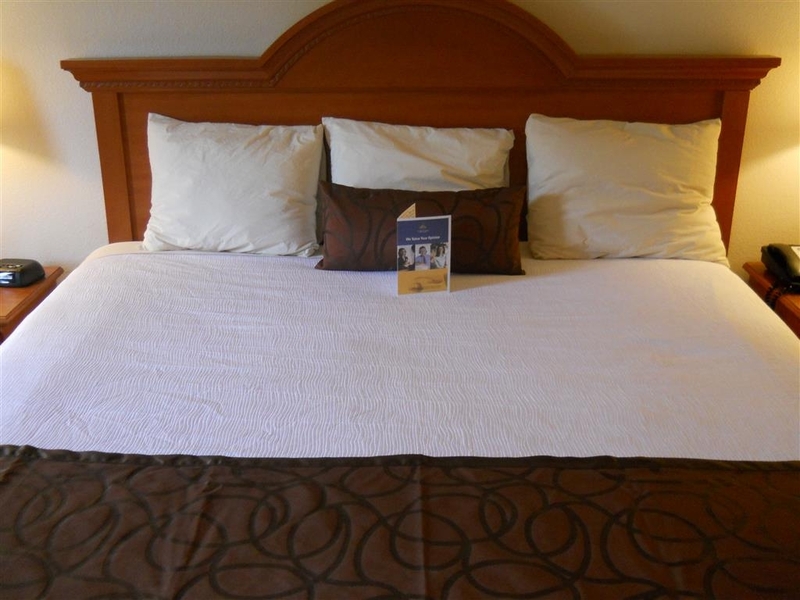 The bed was comfortable, the staff was helpful, and we had a great stay. I'd absolutely stay here again! "Great staff, poor everything else"
There have to be better hotel options in Danville, VA to stay. If so, please find them and stay there. Outside of the polite and friendly staff there are no redeeming qualities about this particular hotel. The hotel was very easy to find and access. 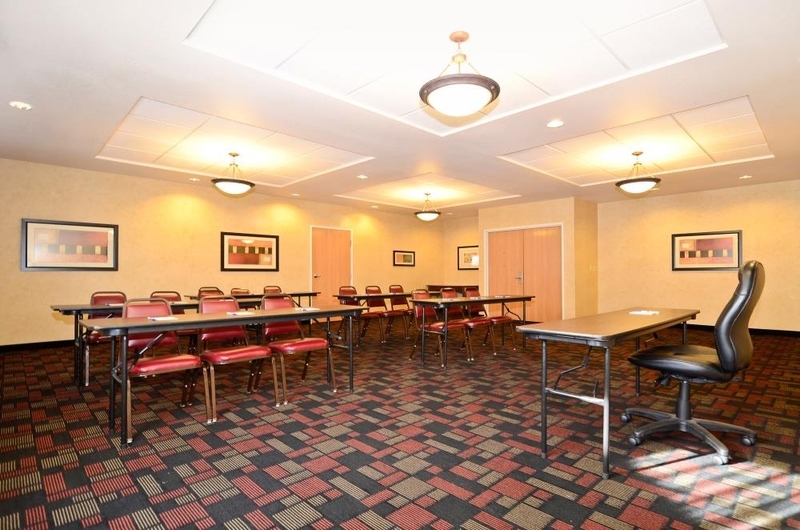 We found the room to be very nice, spacious and definitely handicapped accessible. They also assisted in making the bed accessible for my husband who is in a wheelchair. As usual the breakfast was good with plenty of options. Check in was good done friendly and professionally by general manager. However, everything else was awful. Due to my circumstances, my mom suffered a stroke during our stay and we needed more nights and he put a double on hold for us. The next afternoon the young man, the clerk said that was not true and we were out. The morning of checkout we were rudely awakened by severe banging on hotel door at 8:30 a.m, she explained that the do not disturb sign was on the floor. Awful service. This location of this hotel is easy to find and has a lot of restaurants within view as well as a great location for delivery if you want to eat in. The staff is absolutely great, very cordial, helpful and pleasant to interact with. I especially enjoyed the interactions with their breakfast Manager, Shawn as he went out of his way to make my day start off on the right foot! The room itself was very clean, neatly organized with the space provided and cool atmosphere as we walked in. The only reason I did not give this hotel a 5 star rating was simply due to the beds. They were slightly uncomfortable with some lumpy places and the pillows could use some updating. Also the bed seemed very high off the ground which isn't a problem if you aren't 5'3" and the moved if you leaned up against them so that caused me a bit of an issue attempting to get in and out of the bed. Other than that, I would recommend a stay in this hotel to anyone visiting the Danville, VA area. Polite staff, pool was clean and comfortable. Great stay! Great location! Room was spacious and comfortable, very clean! Could have used some more towels in the bathroom but overall everything was wonderful! Great rooms at a reasonable price. Staff was friendly and helpful. Nice indoor pool...I would definitely recommend. Family friendly in a nice relatively quiet location. Close to shopping and restaurants. Very comfortable bed, accommodating staff, clean room. The traffic was loud early in the morning due to the trucks starting up but was fine once we closed the window. Perhaps a room facing away from the highway would have been better. I am from Danville,Va., but have resided in Augusta, Ga for over 26 years and I visit at least 3 times yearly and this hotel is idea. The indoor pool is a plus and also the fitness room. And after my AAA rate is applied I spend less than $100.00 a night for a good and safe place to stay. My husband and I actually live in the area but needed to stay in a hotel due to our apartment not having water during a snow storm. We booked online and found the accommodations especially affordale for the area. We stayed in a jacuzzi room and enjoyed it. The breakfast was very fresh and the pool was well heated. "Practical well appointed and located hotel"
We unexpectedly stopped here for a room during a long drive. It was extremely reasonably priced, clean, quick to check in, and great breakfast in the morning. All of the staff we came into contact with were nice and professional. Room was spacious, which we needed for a toddler pack and play. I would recommend this hotel to anyone. "Don't let the rough first impression scare you"
I was traveling on business and someone else made the reservation. I was quite put off when I entered the lobby, and the elevator was rough to say the least. That said, the room was large, clean and quite nice. A good bed gave me a good night sleep. The complimentary breakfast was a surprise and excellent. Staff couldn't have been nicer. It is a bit of a distance from downtown and the places you may want to eat. "nice surprise at great location"
Just a parking lot away from US 58, yet the hotel was quiet, clean, and attractive. The room was very clean, most importantly, but also prepared with some nice touches that take time and show attention to detail. Breakfast was good, with variety including lots of fresh fruit, for example. It was parents weekend at Hargrave Military Acd. and this hotel has a indoor pool and hot tub to keep the kids busy. The staff is very nice and helpful. The hot breakfeast is good. I have stayed here many times and have never been disappointed. I really enjoyed my stay this weekend as usual. The hotel is really clean and the staff is AWESOME. The pool is great and allows kids to have fun no matter what time of the year. Breakfast was excellent and room service was AMAZING! We definitely will be returning really soon. Spent one night here and had a spacious, very clean room with a very nice hot breakfast the next morning. Brandon was at the front desk when we checked in and he was exceptionally friendly and courteous. I wanted to use the business center and someone was using it at the time (only one computer) and she indicated she would be using it for a while. I returned to my room and later Brandon phoned me to let me know the business center was available--without my even requesting it! I was impressed by his helpfulness. Would definitely recommend this hotel and stay here again when in the area. "good hotel, sub-par customer service"
We stayed for two nights. The hotel is newer and convenient to a Hardee's and Pigley Wigley. They have a nice in door pool and hot tub. I am giving 3 stars because we had a plumbing issue that we reported the first day, but was not fixed. We called to inquire and was ignored. I would stay again as the price is good and I know how to fix a running toilet. However, they could have done better. Overall facility is great, employees needed work. We travel to Danville, VA, often and usually stay at this hotel. Rooms are attractive and spacious. Usually rooms are in good shape. Staffers are always pleasant and accommodating. 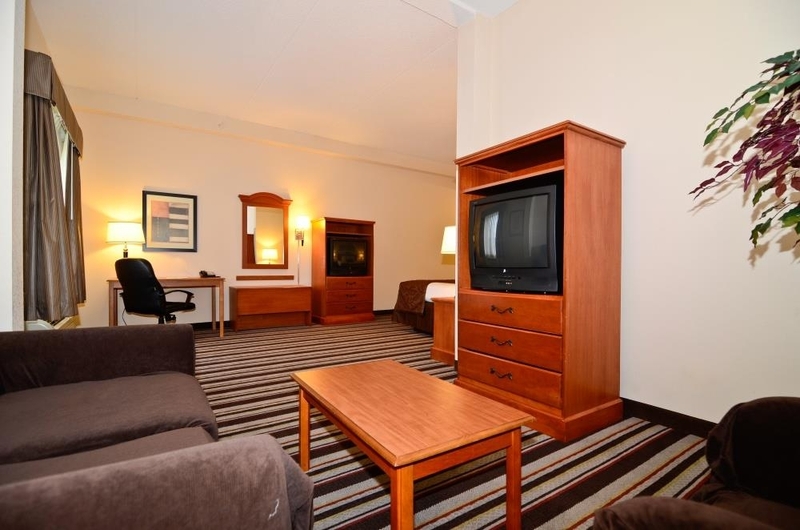 Less expensive hotels in town are usually a substantial drop in quality. Price at this Best Western fluctuates frequently (often related to racing events that come to the area). $80 is a decent price. When it jumps, we usually try to go elsewhere or use our Rewards Points. Most of the time the more expensive hotels are too expensive for us and aren't worth it to us. Best Western tends to have rooms available. They serve a fairly nice breakfast. They also have an indoor pool which is great when we bring grandchildren to town. The hotel was in a good location for the highway traveler, and set back from the road so there was no traffic noise. 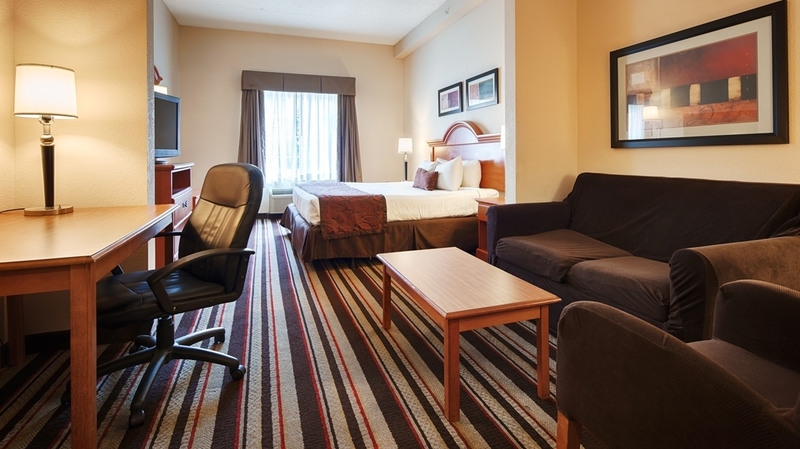 Staff was very pleasant and helpful, room was great. Facility was clean, bed comfortable and breakfast very good, with a large variety for all dietary needs. 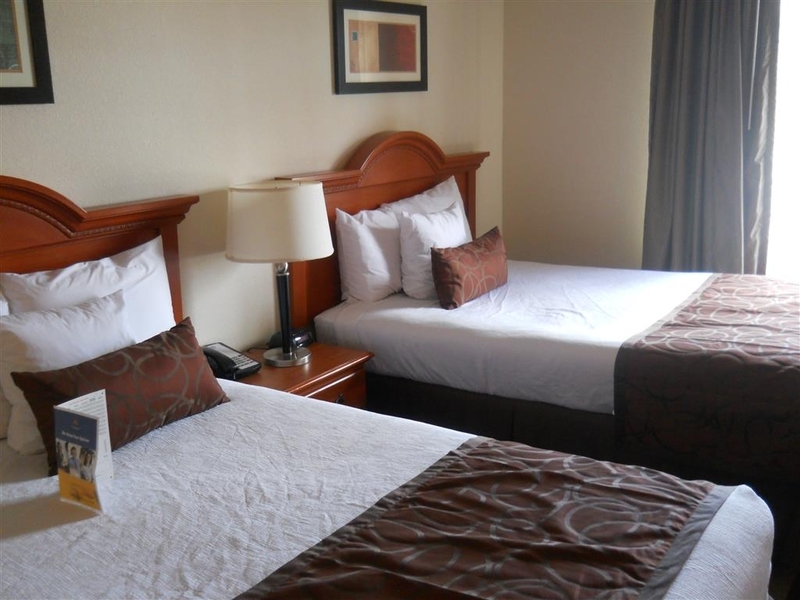 "Great hotel but a little pricey"
The hotel staff is very friendly and the accommodations are clean and comfortable. However, the price has recently increased significantly. I will be looking at other hotels in the area for future trips due to the price increase. For this level of hotel I think this one does everything well. Clean room with frig, microwave and coffee maker make it ideal for saving leftovers or making your first cup of coffee. We hadn't stayed here in two years and I can report that the breakfast is much improved with very attentive staff who are friendly and get anything you need. There were waffles to make fresh, hot eggs, hash browns, and sausage and then cold items included yogurt, boiled eggs, bagels, breads, muffins, danish, fresh fruit (even some already chopped in cups in the frig.) and cereal with juice and coffee. It's a quiet location with easy parking convenient for going to the track and dinner in Danville. The front desk staff were efficient and pleasant. "Best stay at a Best Western!!" Had a perfect Stay! Room was immaculate! Breakfast was great, with plenty of choices- more than just muffins. All of hotel staff was wonderful and pleasant to deal with. Will definitely be returning!! Thank you so much! We stayed here after seeing a show and I was impressed with the customer service of the staff. The front desk people were really nice. As far as he room goes it is an older hotel and certainly needs to be updated. The shower did not work well but overall it is good for an overnight stay. The location is not really near the main area of Danville so you have to drive but it's not too far. Overall I would stay again but not for an extended period of time. "Old linens, breakfast needs improvement"
Bed linens and floor had stains, needs to be replaced. Breakfast food did not taste fresh. Juice dispenser leaked. Foyer was nice, need to pay as much attention to rooms. Room rate was fine for what you got. "Good place to stay en route or for area attractions"
Stayed here one night prior to event @VIR. Staff was friendly during stay, attended to any questions/requests I had. Rooms are spacious and comfortable. It is set back enough from the highway so noise is not an issue, and there are the usual fast-food chains in close proximité. The indoor pool and whirlpool, while nice amenities, could be a bit cleaner. Breakfast is fairly standard basic fare, but gets the job done. Overall, would return to this place. We were looking for a nice place to stay on the way home after visiting family. As we checked around we found this to be the best for our money and the size of bed we were looking for. We also wanted a breakfast on site and yep they had it and the young man was very helpful to everyone. He even help a gentlemen find a barber so he could get ready for a wedding. "Nice to place to stay." Friendly staff, breakfast was excellent! Rooms were clean. Tipping probably helped with the room cleaning, my wife cleaned rooms, so we are aware that these people are trying to make a living, too. I have to go back to this city for business, so I plan to stay here again. "Excellent place to rest your head"
We were looking for a no nonsense just the room sir place while we visited family in the Cascades, Virginia area. We would usually go to North Carolina, but we are banning the state for making choices against the LGBT community. I took out my travel agent wand, and poked around for hotels in the Danville, VA area. We were really surprised with our hitel stay. The pool was heated the way they said the pool would be heated. The room was clean, serviced, and comfortable. The breakfast was the best touch that we weren't expecting. The Waffles are a must to try. And, the front desk staff are great. We will use the hotel in the future. Everything was absolutely great as was the staff. A member of that staff, Mr Shawn Cobbs (Mr Personality), was a great ambassador for that hotel & definatley deserves a promotion and/or raise. The rooms were clean and comfortable. The wi-fi worked very well. Compared to other hotels I've stayed at, this hotel is excellant. "Super friendly staff, clean and comfortable room"
The staff members were the best part of our stay. My husband and I were in Danville for a weekend getaway and decided to stay at the Best Western to save a little money. Neither of us had stayed at one before so we weren't sure what to expect. The hotel was clean and comfortable - nothing fancy, but not shabby. The staff was amazingly friendly, from the gentlemen who were there when we checked in to the woman working the counter in the mornings to the two people who served breakfast (Shawn was one, didn't catch the woman's name). They all went above and beyond and were extremely friendly and helpful and welcoming. 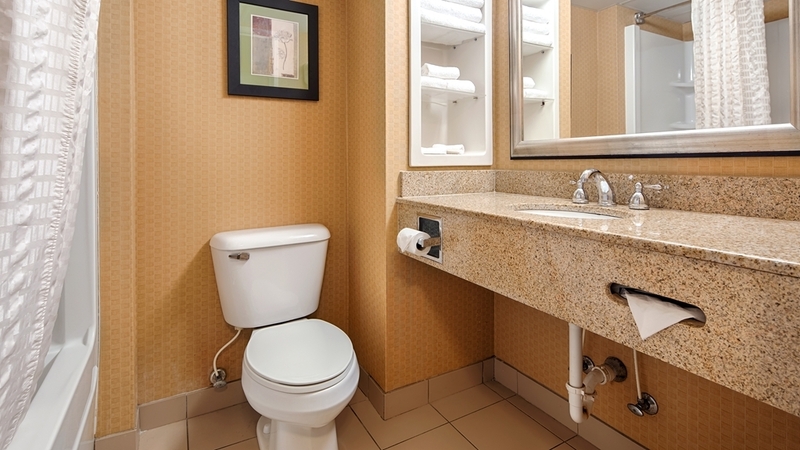 My only complaints: there was trash outside the side door that was there our entire stay (cups and napkins), the sink leaked under the counter (didn't really affect us), and the toilet was hard to flush (handle hard to push down). Nothing that couldn't be fixed easily, and nothing that would prevent me from staying there again. There is a Hardees, Dollar General, Piggly Wiggly, and Advance Auto Parts right next to or across the street from the hotel, and plenty of other things in walking distance, too. Refrigerator and microwave in the room made it nice to bring our own food. This hotel was great for the purpose it served, bed was extremely comfortable, room was clean, the indoor pool and hot tub were a very welcome bonus, however the outdoor lighting fell below expectations when I tripped on uneven pavement and cut my toe very badly, the front desk clerk was very helpful and compassionate to my needs of a bandage and first aid items. "Comfortable suite but some other issues"
Our suite was quite spacious and the bed was very comfortable. It was a bit noisy from arrival (9:30 PM) until about 11:30 in the hallways. There was a funky smell in the hallways, like the carpets need to be replaced or deep cleaned. The room did not have that smell thank goodness. Our toilet did not refill properly after flushing but that was our only issue with the room. We got a good night sleep and were pleasantly surprised by the breakfast. There were several sources of protein available, from yogurt to eggs to sausage. Great stay for an overnight trip for a family wedding. Jessica at the front desk was great. Took care of a smoke odor issue in the room and said she was there for any other needs we may have. Breakfast was filling and it was is always nice to have that option wherever I stay. The young man working breakfast was friendly, helpful and very conscientious about his work and making sure we had whatever we needed. This hotel is very outdated. The furniture is nasty and slip covers try to hide some of it. The mattress is hard and old. The carpet in the bedrooms are damp. We rented 8 rooms and all were in the same bad shape. Great Hotel. Staff was pleasant, courteous and very helpful. We stayed one night on our way to N.C. Staff always had a smile and very upbeat attitude. We have stayed in quite a few hotels and this was by far the best experience. 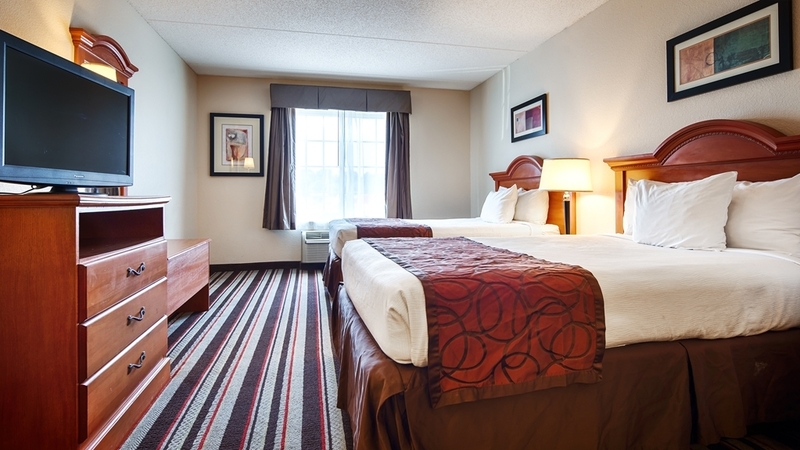 "This hotel is neat, clean and has a very helpful staff"
We called at the last minute and Jessica was WONDERFUL. She gave us directions (that were accurate) to the hotel and offered a great reference for dinner. The room was clean, smelled clean and had a well functioning air conditioner. From the moment we walked through the doors and were greeted with pleasant,quick efficiency, it was a wonderful experience. 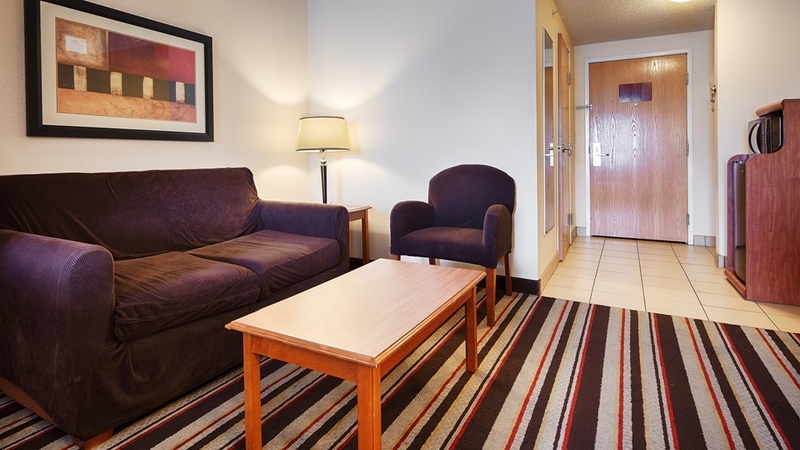 Everyone was professional and friendly.The rooms clean and comfortable. The Food was delicious! I Highly recommend this hotel! I will definitely stay here again! My husband, son, and I stayed here for 4 days and enjoyed our very much enjoyed our stay. It started a little rocky being that we reserved a king suite with pull out couch but when we got ready for bed, we realized it was not a pull out. I called to the front desk....no answer. Went down to the front desk and the front desk attendant was "visiting" with someone and when I inquired about the mix up there was nothing she could do since the NASCAR race was in town but she made a note in the computer. The next morning after the breakfast downstairs we again inquired about getting a pull out couch or cot. Cherice was working the front desk and found us another room which was conveniently right next to the one we were in. Cherice saved the day! The rest of the staff was very friendly and accommodating. Will stay here again! "Pleasant stay with friendly, helpful staff"
While I don't normally consider the typical Best Western a five star motel, this one is definitely above average. The room was quiet, comfortable, clean and up to date. We stayed in room 325 with king bed and it had a tub, which pleased my wife. The breakfast was tasty with a good variety. We'd stay here again. The hotel was clean, room was clean, bed was adequate, breakfast was good. Staff on check in was slow but checkout was fast. Outside landscaping needs some attention. interior of hotel was surprisingly well decorated and nicely kept. We were in room 120 it is a king suite. The only problem was the bed. Springs a Poppin. I was told at check out that the entire property was scheduled to have all new mattresses. Was not given a timeline but once that is done will definitely be placed return to. The staff is fabulous. They treated myself and my wife with the greatest respect. Breakfast was what you would think a nice start to the day but if you're looking for restaurant food go to a restaurant. This is a continental breakfast that has waffles eggs meat etc. we stayed two nights and the place full both nights. I will have to say the guests were very respectful as far as sound levels go at night. Right next-door to Piggly Wiggly so you can run in and pick up things very convenient. All members working for the hotel was very helpful and polite. Especially Shawn the manger in food service. The hotel was very clean and hot coffee was always available. The gym could be some what larger. However, it served my purpose for a short stay weekend. I highly recommend this hotel especially because the price is good for what you get. We got in late to Raleigh Durham airport and could not make it all the way home to Roanoke. We stopped here in the early morning. The room was clean and spacious. Beds comfortable. Breakfast was small but good. Pricing was inexpensive. The staff, especially in the middle of the night, could not have been friendlier! We knew we were back in southern VA..
Room was nicer than I thought and staff is friendly. Although the coffee was good, the rest of the breakfast was largely inedible. Public areas are dirty. The internet worked well and was free with an easy login that they give you at checkin. Check in for my 4 night stay began with hearing the life story of the employee followed by the complete inability to process my credit card(s), we tried three. "Maybe you purchased some things and are over your limit" she concluded. Not possible, I replied. The next morning the system was still inoperative. That afternoon I returned to find that my key didn't work. With the attendant's assistance (a different one) we found the room occupied by someone else. That's right, they gave my room away and cancelled my reservation. We couldn't contact you, they said. We checked and my cell # was in their database. So they gave me another room (credit card system was finally operative) but said they had no vacancies for the next night. He called the "General Manager" who, I was told, would contact me the next day. No call, no reservation, no nothing! As I figured that this was coming I went across the street and booked a room at the Sleep Inn which is a little more expensive but far superior. Never again Worst Western!!!!!! Staff were very nice and the facility was very clean. However, Jumbo the elephant had slept on my saucer shaped mattress. You could hear and feel every spring in the mattress. It may have been luck of the draw, other than that everything was fine. The staff were extremely helpful and friendly! From offering to google information for us, to helping me get breakfast for my kids. It was clean and the room we stayed in was spacious. Since it was a last minute trip for a funeral I did not have a large budget and the price was perfect! You will definitely get your bang for your buck if you stay here! During our 3 night stay, we were pleased with the friendliness, yet professional demeanor of the staff, the room was decent, and the fixtures appeared clean. The fitness room was small but durable. The indoor swimming pool and hot tub were enjoyable as well. Overall, we had an enjoy stay! "A place to stay when racing at VIR." This hotel is another option for lodging when racing at Virginia International Raceway. It's close to the track. The road signage to the track is horrible so make sure to take the route to Milton, N.C., unless you have a long trailer. I was greeted pleasantly upon arrival by the front desk clerk. I checked in in record time since my reservation was through TripAdvisor. There was an odd odor throughout the hotel, but not horrible. The room is spacious with a small sitting area. The room has been cleaned every time I come back. I have no issues with housekeeping. I have been too busy to check out the amenities, but the bed is fairly comfy, the water is hot and I asked for a room away from the elevators, and that's exactly what I got. The breakfast is no frills, but they have hot coffee, so I'm good. For the price, I have no major complaints. Hotel was nice and clean. Room was big. Staff was very friendly. Convenient to restaurants, gas station and grocery store. Price was very high. But it was race weekend. We would stay here again. First Best Western we have stayed in awhile. From the moment we walked into the entrance and had to step over dog poop inside the reception, we should have known better than to stay here. The rug in the reception and our room was very dirty and the tile floor was sticky. The reception people and the breakfast staff were wonderful and made the extra effort to be helpful. We had a good stay at the hotel. The staff was great, and helpful! The hot tube was actually hot. The Breakfast attendant was great! We have dietary restrictions (we don't eat pork) and they offered us meats that were able to eat. "Great service made it a better stay"
The facility is fine. Clean, spacious. The service made it better. Desk staff was efficient and helpful. Star employee was Shawn in the breakfast area. He made it a point to ensure that each customer was served well with what they wanted. He made it feel more like a bed & breakfast than a chain hotel. stayed here February 3rd-6th. I visit my mother and step father twice a year in danville and decided to stay here and I do not regret this choice at all. breakfast was superb, pool was perfect temp, room was very spacious and comfortable. Staff was very welcoming and helping. overall nothing was wrong when I stayed here will definitely be back when I come down from chicago again. Also i will be recommending my family who also visit my mother to stay here! Tis is the 2nd time in a month that we stayed at this hotel. We were there a month ago and loved everything about it, so when we had to come back again we decided to stay here again. The staff to the front desk, the maids and the breakfast cafe help is exceptional. I even called the hotel to compliment Shaun who we saw every day for breakfast. He made every morning fun and we felt he gave us the royal treatment. Great hotel friendly staff and clean. the bed was worn out needs replaced, very creaky poppy and springs poke you. that was the only bad thing. the breakfast was Hot and fresh they had a great variety. The Hot Tub was the best part i did not want to get out of the water. and the indoor pool is great just needs to be warmer. the water was pretty cold for an indoor heated pool. I will return and stay here again. the hotel was very quite and 24 hour coffee in the lobby is a plus. Thank you so very much for taking the time to review our property. Please accept our apologies for the bedding . We will have our maintenance department look in to the issue. It was a pleasure to have you here and we are delighted you have enjoyed our Breakfast and the hot tub as well as the indoor pool. Best Regards! We use this hotel when visiting family in the area. They are consistent with their service. I like the fact that they have a gym and indoor pool. The breakfast has a variety with everything from scrambled eggs to cereal. "The Better Western Windsor Inn"
From the time I stepped foot into the hotel, I was warmly greeted by the front desk agent Jessica. Patrick offered to carry my luggage to the room. The housekeeping staff that I met on the floor was all smile as well as the manager Vita. Kudos to a great team!!! Thank you for taking the time to review our property on Trip Advisor. We are delighted that you have enjoyed your stay with us. Please come back anytime. Best Regards! The staff was amazing. Everyone you encountered was pleasing and helpful. The room was clean and neat. This is actually now my favorite place to stay while in the area. I would have no problem recommending it to anyone. I compared my experience to that of family members who stayed at Marriott and needless to say I think they will be staying at Best Western their next visit. My only complaint is that the turkey bacon was overcooked. Otherwise everything was outstanding. I stayed at the best western in Danville virginia for a funeral. This was the worst experience ever and I doubt I will be back. The reservation was under my name and a companions name so they could check in. When my companion arrived the staff harassed her not wanted to allow her to check in. Finally they took her card and allowed her to check in. After checking in we found the room to be with out couches like it was described. After calling back and finding out customer service couldn't do anything I had to purchase a third room. Once I arrived and checked into the third room we separated into our rooms. For the most part the room was okay. The breakfast was not so great. After breakfast I was packing my stuff. While I was taking it to the car I stayed outside for a little. When I came back in I walked to my room and received a call. They were calling me to tell me I left some belongings there. I hadn't checked out but they were already cleaning my stuff. I go to the front desk and get my stuff back. I leave and head to the funeral. After which i get a text saying I was charged 100 dollars more from them. After a phone call I find out they were accusing us of taking two pillows. Then customer relations can't do anything. So this is now twice customer service can't do anything to help me as a paying customer. They tell me to call that hotel which I do and after which I demand a manager. Only to be told the only one there is not available at the store. After persuasion I get his cell number and at this point I'm over being nice. After everything piling up on top I'm fed up. That was my grocery money and they took it for no reason. The manager was at some game I think he said and he couldn't help me. So there is no manager on duty to help the customer. I was suppose to by dinner on the way home for the group but my card is useless now. So instead I had to go borrow money to buy the groceries I need. I was not very nice I know but when you count on something to feed a household with four kids you get emotional. "Wonderful Hotel & Courteous Staff"
Extremely courteous staff. Not just one of them, but all of them. My mother needed a handicap shower, and the staff showed her a room prior to reserving the room to make sure it would do. Not many hotels would do this. Rooms are large, and clean. Hot breakfast, and Shawn was eager to make sure you had anything you needed. Highly recommend!! Employees are very nice and the room was very clean. Would recommend it to everyone. Breakfast had hot and cold food. Very easy to find. This is a great place to stay. Did get to use the pool but next time we hope to use it. This hotel is very clean and quiet. The staff are very friendly and helpful. The breakfast is minimal but not bad, with the offering of some hot food items (eggs, waffles, etc). The bread I used for toast was stale. The complaint I have is that the king size mattress was an open coil mattress. VERY UNCOMFORTABLE. Not my first stay at a Best Western, so I know that they aren't all like that, but was unpleasantly surprised and the level of discomfort. Also, breakfast was cold. Amazing customer service! ! I was very pleased with my stay and will be staying there next year for the race as well. Everyone that works there was pleasant, they did every thing possible to make sure their guests were happy. Loved it. The stay was fine, room was clean and big enough. The hotel had a school band staying, two bus full and when they were done with Breakfast they was no food left for other guest. Need more food at the breakfast station. "Great beds, quiet night, Friendly Staff"
Great overnight stop, great beds, well maintained and clean, quick breakfast and a very friendly staff. Even with a large group, the staff was quick to respond. The hot tub was broken but otherwise the facility was a great shape and a good value for what I paid. In response to a less than favorable survey I completed about this property, the general manager sent me an email offering (and I quote) "a 100% discount on a future stay". When I tried to take advantage of the offer , he refused to honor it. Best Western's corporate offices( Customer Care) was notified and they encountered the same rudeness I did in dealing with him. Stay here if you must , but beware that management will not uphold any promises/offers they make. During our last visit to the area we stayed at the Sleep Inn and Suites across from the Danville airport and had a wonderful experience. "A nice place to stay at a good rate"
We were pleased with our rooms, beds, pillows and cleanliness. The staff was friendly and helpful. The rates were good. The only minor criticism I have is the breakfast was adequate but nothing special. I would stay there without question again. I am very sorry that you did not like your accommodations here at the Best Western Inn Danville, VA. This is the first t hat I am hearing about my hotel being smelly. I will look into this matter for you. We take pride in our hotel and what our guest have to say. Hope you give us another try. Thanks you! Edward J. Davis General Manager. Stayed at this Best Western while attending the races at VIR. The room was spotless, the internet reliable and the staff was the best! The only thing the staff couldn't do was stop the rain. I'll be staying here for every visit to VIR. Thank you for your review of our hotel! 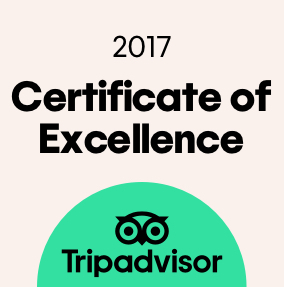 We are pleased to know that we exceeded your expectations. We will look forward to your return visit upon your next trip to the Danville, VA area. Thank you! I've stayed here a few times and the service has always been great and still is. The hotel itself could use maybe a shampooing of the carpeted areas to reduce the musty smell. I overheard a couple guest stating that they saw a roach in their rooms. I personally didn't see this but it's something to consider and I would recommend an exterminator before things get out of hand. The buffet breakfast was still awesome with a range of hot and cold items to eat. "Average hotel with better ones for the same price in town." This hotel is an average hotel with poor wi-fi, large rooms, and cheap construction. First off, the negatives. The room layout is somewhat odd with a large Jacuzzi tub in the middle of the room (NOT in the bathroom where the shower and toilet are). It also feels like there is no sound insulation between rooms so when your neighbor decides to take a shower, or heaven forbid fill up his large bathtub, you can hear it. And it takes what feels like an eternity to fill up the tub!. The wi-fi is spotty at best and did not have enough bandwidth to stream a video and kept dropping the signal to the point I spent 3 days using my 4G connection from my phone's hotspot instead. The breakfast is ok at best. The rooms are large and the bed is comfortable though for what its worth. I have stayed at the Hampton Inn down the road and would suggest it for the price. "Average hotel with unreliable wi-fi." It's an average hotel with no sound insulation, a large Jacuzzi tub literally in the room (not in the bathroom), and horrible wi-fi. When a room next to yours fills up their tub or uses the shower (that's actually in the bathroom) you can hear everything, including the water running for what feels like 15 minutes to fill up the tub. The wi-fi didn't have enough bandwidth to stream a TV show on my iPad and kept dropping connections. On the plus side, the rooms are large, beds are comfortable, and breakfast is not bad. I have stayed at the Hampton Inn in town and prefer that hotel for just about the same money.